Allometric variations in tree height and stem diameter are a genetically controlled trait that reflects the ability of trees to adjust to different environmental conditions. 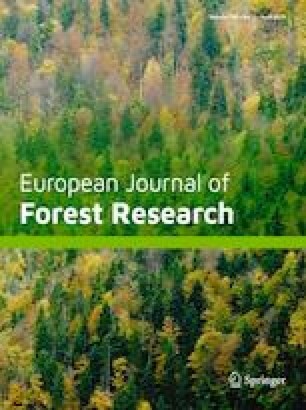 This paper examines the ecological control of abiotic and forest-state variables on height- and stem diameter-growth in oriental beech (Fagus orientalis Lipsky) in an unmanaged, high-elevation forest of northern Iran. Spatially explicit abiotic variables of growing-season mean potential solar radiation, mean air temperature, topographic wetness index (TWI, as a proxy of soil water content) and wind velocity essential to the analysis were generated numerically by computer models. Forest-state variables of total tree height (H) and diameter at breast height (D) and stand basal area (BA) were assessed at individual sample plots. Degree of explanation of observed variation in individual-tree H and plot-level changes in stem D (i.e. dD/dt) by the assemblage of modelled abiotic and observed tree variables was 87.4%, with a root mean squared error (RMSE) and mean absolute error (MAE) of 3.60 and 2.84 m and 67.3%, RMSE = 0.13 cm and MAE = 0.10 cm, respectively. Wind velocity, TWI and mean air temperature provided the greatest overall influence on the calculation of static H and annual D-increment, with relative impact of 38.3, 37.3 and 9.6 and 7.7, 6.4 and 6.7, respectively. The other variables, including BA, had weak to no control on tree-growth response. Methods used here are sufficiently general to address tree-growth response in many other tree species around the world, with or without changes to site conditions. We are particularly grateful to: (1) D. Edwin Swift formerly of the Canadian Wood Fibre Centre, Canadian Forest Service-Atlantic Forestry Centre, Natural Resources Canada, Fredericton, New Brunswick, Canada, for his comprehensive examination of the original manuscript with respect to both its scientific content and presentation; (2) the Natural Resources Faculty, University of Tehran, Karaj, Iran, for use of the Kheyrud experimental forest and for logistical support to MB; (3) the Ecology and Environmental College, Inner Mongolia Agricultural University, Hohhot, Inner Mongolia, China, in support of CZ’s participation in this work; and (4) the Faculty of Forestry and Environmental Management, University of New Brunswick, New Brunswick, Canada, for computer resources and relevant modelling, plotting, and GIS software. We also acknowledge the US National Aeronautics and Space Administration for providing SRTM Plus V3 data free of charge.